NITECORE Battery Chargers: Which Charger is Right for You? 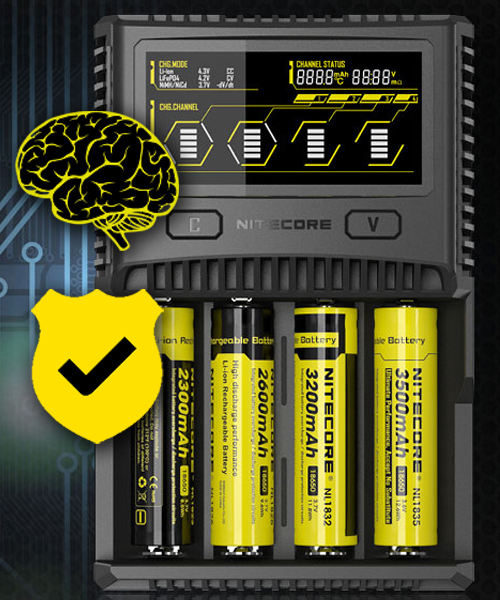 All NITECORE chargers feature intelligent circuitry to automatically detect your battery and apply the optimal charging current for each chemistry. This prolongs the life of your battery and gives you the quickest charge possible for your configuration. Did we say our chargers are smart? With features like automatic charging timeout, reverse polarity detection and short circuit prevent, you can rest assured your batteries will be safe throughout the charging process. NITECORE chargers are known around the globe for reliability, affordability and quality. Whether you’re charging batteries for your flashlight, vape, or other device, know you’re in good hands. Ideal for travel, these digital chargers are slim and powered by USB input for universal compatibility. For a budget-friendly option you can use to charge li-ion and IMR batteries on the go, try UM10 (single slot) or UM20 (dual slot). Or for even faster speeds, try the QuickCharge enabled UMS2 or UMS4. We call these chargers our work horses for a good reason. These straightforward universal battery chargers offer drop and go charging with an easy to read indicator light. 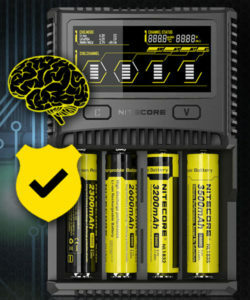 NITECORE offers a 2-slot (i2), 4-slot (i4) and 8-slot (i8) version so you can pick the set up that best suits your needs. Want something a little fancier? The D Series is our fully digital universal charging option available in 2-slot (D2) and 4-slot (D4) versions. Whichever you choose, a brightly lit screen will report key charging and battery information so you’ll always know what’s going on. For those of you that demand the best and fastest available, look no further than the SC series. Speedy charging and an easy to read digital display make the 2-slot SC2 and 4-slot SC4 the deluxe option for NITECORE chargers. If you’re needing to charge li-ion and IMR batteries only, the NITECORE Q series combines fast charging speeds with a no-frills display in a lightweight and portable body. Available as a 2-slot (Q2), 4-slot (Q4) or 6-slot (Q6) options. For a charger that doubles as power bank, NITECORE offers the F1 single-slot and F2 dual-slot travel chargers. Use these chargers with a USB power source to recharge your li-ion/IMR batteries or toggle the device to output and use your full battery to power other devices! Sometimes a traditional charger isn’t the best solution. That’s why NITECORE developed several charging gadgets like the LC10 magnetic USB charging cable and VCL10 QuickCharge 3.0 car adapter. These chargers allow you to power your batteries and devices quickly and safely no matter where you adventure takes you while adding extra functionality like backup lights to keep you safe.